Sometimes, I can't leave the house. When work is slow and I'm feeling financially insecure, the last thing I feel is useful is getting away from my computer, where my brain tells me there's some task or some job just a few clicks away that is going to turn things around. During really slow periods of work, this idea ferments in my mind and I become a hermit. It's really frustrating and I hate it, but because so much of my work does come from the time spent plugged into my computer, it's hard not to listen to that instinct. fried and I'm just not in a good place. The beginning of the year is always hard for me because it's when everything I use professionally ( and personally) needs to be renewed: my insurances, my software licensing, my website, my professional subscriptions, etc. On top of that, it's tax season. So, I bleed money the first few months and as a nubile independent photographer (freelancer) in a city that I don't have deep roots in, it's stressful. I'm still building my client list and, just like for the rest of us, survival isn't easy. But I got out for a few hours Friday and fled to Venice, my sanctuary, with my video camera and a new variable filter I wanted to test out. I figured I'd go down and shoot some clips and editing together some sort of random montage. Fortunately, I ended up talking to one of the many musicians dotting the boardwalk as soon as I got down to the Venice fishing pier and I got to record him. That gave me a base to form something off of and I spent the rest of the evening recording whatever I wanted and made my way back home after dark. 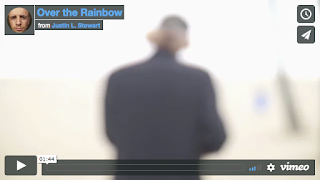 Over the Rainbow from Justin L. Stewart on Vimeo. It's a good feeling to be out wandering and playing with these things. It's also just nice to have some human connection beyond the walls of my home office. I set out to put something together that I owned and felt certain of and that I could just throw out there and be proud of. Unfortunately, insecurities got the best of me and I was off and on editing all weekend, picking my playful piece apart and taking away from what was a really gratifying and needed experience. It's really hard to not be critical of your own work and to think of something as more playful than professional. Maybe that's something that's come about as I've made the leap from student to professional and begun worrying more about what image I'm putting out there, especially as someone who's making images. Maybe I shouldn't worry so much and should just preface things as playful practice. Who knows... BUT, I got out, I had some fun filming, and hopefully I put together a little fun piece that's not too riddled with glaring issues. Hope you enjoy the video! Thanks to all the people that read this far.